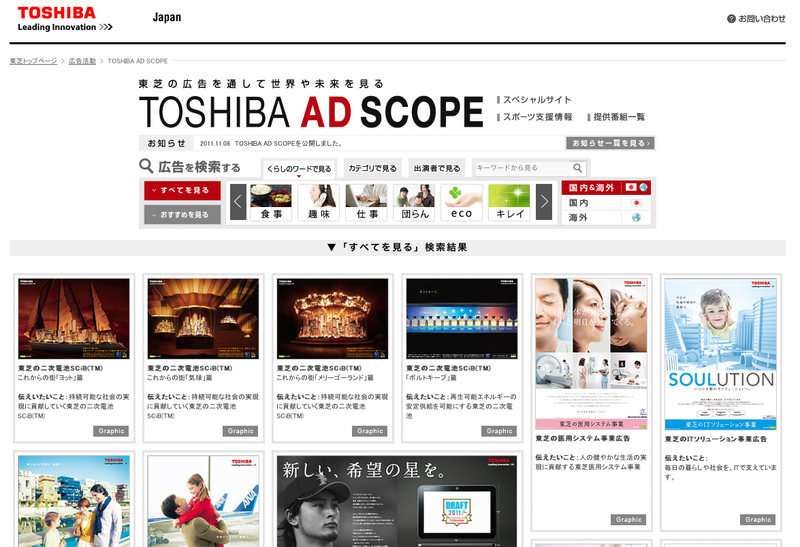 Our team in Japan announced today that Toshiba Corporation has adopted the Brightcove Video Cloud online video platform for its official ad portal website, "TOSHIBA AD SCOPE". The ad portal contains not only Japanese ads but also commercial messages and graphic ads from overseas. Toshiba decided to revamp its ad portal to make it easier for visitors to search ads and find content through keywords, as well as ensure visitors could view content across mobile devices and desktops. Video Cloud was chosen because of its ability to easily manage and deliver Toshiba's fast-growing library of video ads more broadly. Video Cloud enables Toshiba to deliver high quality video content as well as customize the video experience throughout TOSHIBA AD SCOPE. Video Cloud's Smart Players also ensure Toshiba's video content is accessible across desktops and Flash and HTML5-compatible mobile devices. This is another exciting win for the Brightcove KK team. Other recently announced customers include Seiko Watch, NHK for Schools, and Honda Motor Co.